The Toronto Maple Leafs kept Kasperi Kapanen out of the lineup on Monday with what they deemed as an illness, but gave a more serious diagnosis today. Kapanen will be held out again tonight because of a concussion, sustained at some point during the game in Edmonton on Saturday night. Kapanen, 22, has been a welcome addition to the Maple Leafs this season, recording 42 points in 68 games in his first real opportunity as a full-time NHL player. Originally selected by the Pittsburgh Penguins, he came to Toronto in the Phil Kessel deal several years ago and had only really found his way to the Maple Leafs roster late last year. 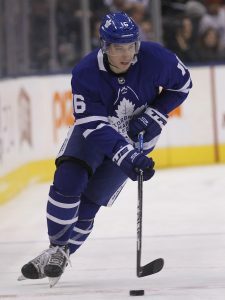 The speedy winger has developed into an excellent counter-attack option that can make teams pay for turning the puck over, and is even used as a penalty killer by head coach Mike Babcock. Losing him right now as the Maple Leafs attempt to track down the Boston Bruins in the standings isn’t a perfect scenario, but the team does have other options to take over Kapanen’s minutes. William Nylander has been promoted to the wing of Auston Matthews while young forward Trevor Moore will likely see regular time on the fourth line. There is currently no timetable for Kapanen’s return, but his penchant for scoring timely goals will certainly be needed if the Maple Leafs are expecting to do any damage in the playoffs this year. The Senators have been keeping a very close eye on the Jets lately, notes Jason Bell of the Winnipeg Free Press. GM Pierre Dorion along with two other front office members have been in Winnipeg since Thursday to take a closer look at some potential trade targets; Bell speculates that center Jack Roslovic, defenseman Sami Niku, and goalie Eric Comrie are among the players they’re keeping tabs on. Ottawa has a pair of prominent rental players that the Jets would certainly be interested in with center Matt Duchene and winger Mark Stone but each would command a significant return that would likely involve Winnipeg’s first-round pick and potentially one of those youngsters as well. Toronto is expected to hold exploratory discussions regarding a possible contract extension for winger Kasperi Kapanen, reports TSN’s Darren Dreger. The 22-year-old’s first full NHL season has been a highly successful one as he already has 18 goals and 18 assists through 57 games, lining him up for a considerable raise on his current salary of just over $830K. With a tight salary cap situation looming for the Maple Leafs, he has been a popular speculative target for an offer sheet this summer so it’s not surprising that GM Kyle Dubas is at least going to look into what it’s going to cost to lock him either long term or on a bridge contract. Although the Red Wings were without center Frans Nielsen this afternoon against Philadelphia, this should be the only game he misses. The team noted (Twitter link) that Nielsen is dealing with a minor illness and they are hopeful that he’ll return to the lineup on Sunday. The 34-year-old very quietly sits fourth in team scoring with 30 points (9-21-30) in 54 games so far this season. The Carolina Hurricanes have been rumored to be very interested in adding a scoring forward this season, and they may have almost gotten their wish last week. On the latest edition of Insider Trading for TSN, Pierre LeBrun reports that a deal fell through at the last minute with a Western Conference team. LeBrun restates the Hurricanes’ interest in a top-six forward and while it sounds like William Nylander is off the table after signing his long deal, apparently they have interest in Kasperi Kapanen of the Toronto Maple Leafs. Speculation can run wild on who the Hurricanes were dealing with in the West, but the simple fact is that Carolina is urgently looking to get some more firepower up front. With another goal tonight for the Maple Leafs, Kapanen continues to impress in an elevated position next to Auston Matthews and is setting himself up for a nice contract negotiation of his own in the offseason. The 22-year old forward had struggled to find any real consistency at the NHL level for the first few years of his career, but had 21 points in 31 games coming into tonight’s action and is finally fulfilling the potential that made him a first-round pick. The Maple Leafs of course have other concerns in the summer months, given that Matthews and Mitch Marner are also restricted free agents. Even if Kapanen is not available—which LeBrun makes no real assertion on one way or the other—there will be plenty of offense to go around as the trade deadline nears later this season. Another name mentioned in the segment by insider Bob McKenzie, though not in specific reference to Carolina is Jeff Carter, who still has three years left on his contract after 2018-19 but isn’t actually owed much salary. That makes him a pretty attractive trade target if teams are willing to sacrifice some young assets for the rebuild in Los Angeles, though nothing seems imminent there either. One has to wonder whether Carolina will find what they’re looking for soon, given the urgency the front office is likely feeling. The team entered play tonight at 13-12-4 but had scored just 72 goals in those 29 games. That put them ahead of only the Kings, a place you don’t want to be if you’re trying to compete for a playoff spot in the Metropolitan Division. If the Toronto Maple Leafs can’t find a deal that they like, the team is willing to allow restricted free agent holdout William Nylander to sit out the entire season, according to Sportsnet’s Chris Johnston on Hockey Night in Canada. “If there isn’t a trade that presents itself — and we spoke last week about the fact that they are gauging the market on William Nylander, and William Nylander’s demands don’t come to the range that they’re comfortable paying — they’re comfortable letting this player sit and I think that’s significant with the fact that it’s 13-plus days remaining and tensions only to get a little higher as we get closer to Dec. 1,” Johnston said. For a team with the potential to win now while they have many players on entry-level deals, that may not be the best course of action. Nylander is a major free agent and the team could use Nylander or the potential returns from a trade, whose situation must be decided on by Dec. 1. With the emergence of Kasperi Kapanen, who also will be a restricted free agent next season, the team may not need Nylander’s offense, but with a struggling defense, the team could use a trade to bring in much needed defensive help for a team attempting to challenge for a Stanley Cup now. The last player to sit out an entire season due to a contract dispute was Michael Peca when he sat out the 2001-02 season while at a contract impasse with the Buffalo Sabres. Of course, Toronto may be sending that message out to teams with the hope of increasing offers from other teams who hope to get Nylander at a reduced price as that Dec. 1 deadline nears. If teams believe that Toronto will let him sit, teams may be willing to hand over more assets to get a deal done before the deadline.